You sit too much. You sit with poor posture. You have a sore back. This is the truth for far too many people. Fortunately, many enterprising inventors are working on solutions and the possibilities for help are increasing daily. In this post we will have a look at a new contender – the BetterBack created by Katherine Krug. The BetterBack is not quite on the market yet but will be soon with the amazing support it has got on Kickstarter. As of today it has 9000 backers willing to put down their hard earned cash to make it a reality. In the crowdfunding world this is rockstar performance and means the new product is really getting people excited. Well, for a starter, a huge number of us are paying the price of our sitting based lifestyles – back pain. That so many people are looking for an answer to this problem is a real opportunity for innovators. Those of you who read our posts know that generally speaking, we are not fans of posture braces. They tend to weaken the very muscles that need to be strengthened and are at best, a band aide solution. Most lower back braces have a similar format – they use some combination of stretchy and rigid materials to partially immobilise your lower back in an effort to stop your spine moving out of alignment. Two good ones are the Mueller and the Double Pull. But . . . the BetterBack takes a different approach. It uses stabilising straps that go over your knees to hold your lower back in alignment. In effect, this design removes the influence of the chair you sit on – a very neat trick as most chairs are useless for aligning your back. Whether this arrangement proves effective in reality as the products starts to ship, will be very interesting. We may do a hands on review later as it is exciting to see a different approach being taken. 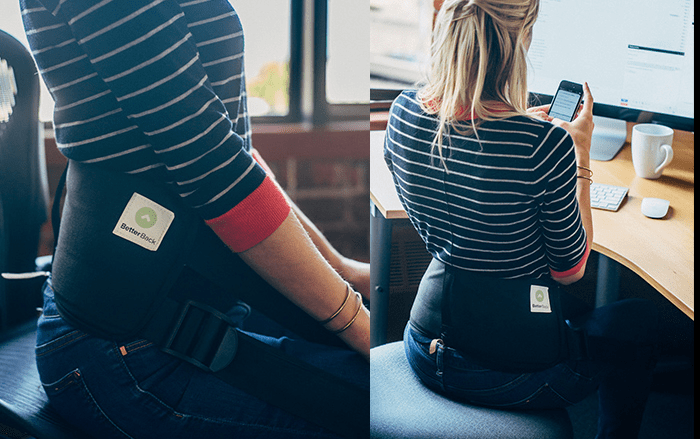 With a target fundraising figure of $12 500 and currently over $650 000 raised, the BetterBack posture brace looks sure to go into production. You have a couple more days to pre-order one over on Kickstarter. They still have a few $49 usd options left (predicted retail will be $99 usd). Definitely worth a look. A low tech solution to a very real problem. We like the unique approach of using stabilising straps, and the designer seems to have thought the product through carefully. At $49 usd (through Kickstarter) this is very good value. looks like a great design!